Comic Updates Every Tuesday and Thursday. MIKE DEODATO'S JADE WARRIORS tells the story of the last generation of warrior women genetically engineered to conceive, give birth to, and protect the child of a Dragon! The Dragons were undisputed rulers of the prehistoric Earth, but were wiped out in the same cataclysm that killed off nearly every other living thing on the planet. This Dragon, having disguised his true form by masquerading as a Japanese crimelord, is the last of his kind, who intends to use the child's powers to repopulate the species, take over Japan,and from there, the entire planet, with him as it's ruler. Angel Sorayama, code named Deathkiss, was once part of the Jade Warriors, until one night she killed one of her clan sisters and fled into the night. The remaining team members have sworn to bring her back to their master, at any cost, while Deathkiss has sworn to stop her formaer master, even if she has to kill the only family she's ever known to do so. Deathkiss has only two allies to back her up-- Bob Campbell, a freelance writer; and Naomi Sellers, the manager of an exotic dance club. Not exactly a "dream team" when going up against assassins with a lifetime of training! And what part with the nigh-indestructible Ramthar play in this battle? Co-Creator and Artist Brazilian artist Mike Deodato, Jr. (born Deodato Taumaturgo Borges Filho) has become an enduring fan favorite, working in styles ranging from wildly energetic cartooning to moody photorealism. His father, also a Brazilian comic-book artist, inspired Deodato.s lifelong love of comics and guided his son.s artistic development. A professional artist since 1985, Deodato often collaborated with his father on comics in a wide variety of genres. Always a fan of American comics, Deodato broke into the U.S. market with projects like Malibu.s Santa Claws and Innovation.s Beauty and the Beast. Switching from his original realistic style to an Image-influenced dynamism during the early 1990s, he made a name for himself with a popular run on DC Comics. Wonder Woman. Deodato became one of the decade.s most prolific and in-demand artists, including Marvel credits such as Avengers, Elektra, Incredible Hulk, Spider-Man and Thor. During this time, he also launched his co-created series, Mike Deodato's Jade Warriors. Gradually feeling overexposed and overextended, he cut back on his workload and reinvented his art again, crafting a darker, more detailed, more personally satisfying style. After trying out this new look in a Nightcrawler story for X-Men Unlimited, Deodato landed one of his favorite assignments to date, collaborating with writer Bruce Jones on Incredible Hulk. Subsequent assignments for the currently Marvel-exclusive artist have included Witches, New Avengers, the J. Michael Straczynski run on Amazing Spider-Man, Thunderbolts, Wolverine: Origins, Dark Avengers and Secret Avengers. Co-Creator and Writer Writer Michael Buckley started out by managing a comic book store in the mid 1980's, where he met up with David Campiti. The two forged both a friendship and working relationship that has lasted for over 25 years. 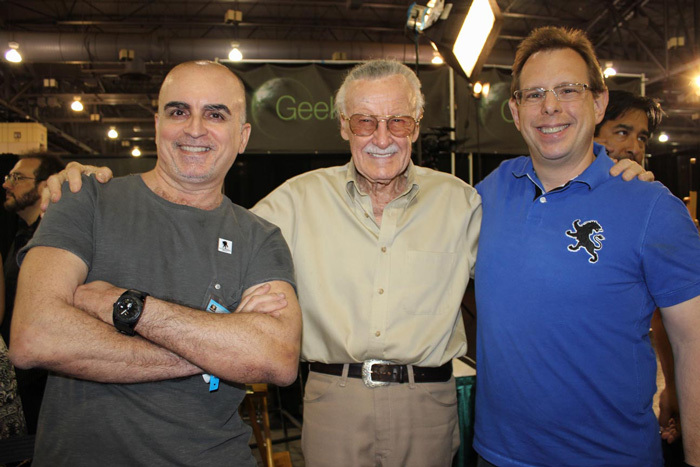 Michael has been writing comics professionally since the early 1990's, contributing stories to the flagship title of Innovation, Hero Alliance. 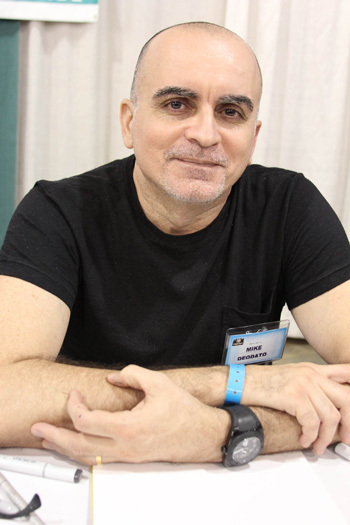 Since then, he has worked both solo, and in collaboration with David Campiti, on a wide variety of books for publishers including Image, POP Comics, and Avatar. He is also the co-creator, along with David Campiti and Mike Deodato, of Mike Deodato's Jade Warriors. Currently, Michael is working on several creator-owned projects in various stages of development, including a prose novel. Writer and CEO of Glass House Graphics David Campiti progressed from freelance writing to founding Innovative Corp, in 1988, known publicly as .Innovation Publishing.. Under David.s control as Publisher and Editor-in-Chief, Innovation became #4 in the market share, below only Marvel Comics, DC Comics, and Dark Horse, as it brought to prominence many literary, film, and TV tie-in series and adaptations, such as Anne Rice.s The Vampire Lestat, Beauty and the Beast, Dark Shadows, Lost in Space, Piers Anthony.s On a Pale Horse, Quantum Leap, and many others. In 1993, David resigned from Innovation to launch Glass House Graphics ­ a professional service firm that provides development and organizational services as well as illustrators, writers, painters, and digital designers ­ where he holds the position of CEO and Global Talent Supervisor. David has also served as a Consulting Publisher of MAD Magazine in Brazil and has been a columnist for several publications. Currently, in addition to writing, he oversees three offices in Brazil; one in Manila, Philippines; one in New Delhi, India; and two new locations in Indonesia ­ coordinating creative services from a roster of nearly 120 talents worldwide to produce animation, art, digital graphics, and stories for scores of clients. He currently produced animated films, as well. DEATHKISS (Angel Sorayama), formerly ONYX of the Jade Warriors, she has an ability they lack--her saliva is acidic, capable, in large enough amounts, of eating through steel. It also contains microorganisms that, when mingled with someone else's, generate an uncontrolled reorganization of the other person's DNA, killing them quickly, and painfully. She has committed an act for which there is no forgiveness, forcing her to leave the team, with the rest of them hot on her high heels! JADE (Roberta Mui) The oldest, and leader of the Jade Warriors. Like her clan sisters, she is a product of genetic engineering, which endowed her with strength, agility and the ability to heal from wounds that would kill a normal human. Her sister was killed by Deathkiss, and she plans to even the score! RUBY (Anita Lee) She is the best of them with a katana, deadly to even experienced swordfighters. She doesn't realize her own leadership abilities, surprised when the younger Jade Warriors consider her to be the de facto second in command. SAPPHIRE (Michelle Lee) She is an expert with any firearm, and a deadly shot. She prefers to shoot people and blow things up, rather than engage in close combat, though that doesn't stop her from being able to fight unarmed! ONYX (Nikki Howard) She is the youngest of them, having taken the code name formerly used by Deathkiss. She has to fight to prove herself not only because of her age, but because she was born in America. RAMTHAR He is a genetically engineered soldier currently in the service of the master of the Jade Warriors. OYABUN MASUSETSKE He is a Lord of the Japanese Yakuza, master of a criminal empire. But he holds a secret--he the last surviving member of a species of dragons that once ruled the planet before a prehistoric cataclysm killed all but him. He has a plan, and the Jade Warriors are essential to it, but for what she has learned, Deathkiss must die! BOB CAMPBELL He is a freelance writer from Poway, California, who has no idea that walking into a restaurant for some lunch would result in the adventure of a lifetime! NAOMI SELLERS She is the manager of a exotic nightclub, who wonders if her newest dancer, Angel Sorayama might prove TOO exciting!